While I am someone who believes that every single day is Multicultural Children's Book Day, I certainly do acknowledge and appreciate the @readyourworldmcbd initiative by Mia Wenjen (@pragmaticmom) and Valarie Budayr (@valariebudayr) Today marks the 5th year of Multicultural Children's Book Day in the United States, and I am happy to review this book that was sent to me as part of this initiative. 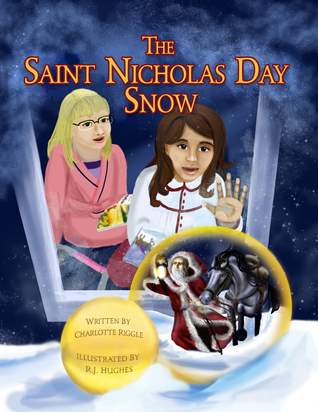 I received The Saint Nicholas Day Snow from the author, Charlotte Riggle, who happens to be the Silver Sponsor for MCBD. This picturebook tells the story of how two young girls, Elizabeth and Catherine, and their families spend St. Nicholas Day (celebrated mostly on December 6). Here is my honest review of this book in the form of 3 bullet points.1) As a spiritual, non-religious person, who was brought up in a fairly liberal Hindu household, I found it informative to learn about St. Nicholas Day and how Orthodox Christians celebrate it. I found the Author's Notes at the end of the book useful, for it provides a detailed overview about St. Nicholas; why he is considered a saint; why he is sometimes called Santa Claus, so on and so forth. 2) The illustrator, R.J. Hughes does a good job of presenting multiple visual stories even though the verbal text tells a single story. In each spread, there is a visual accompaniment to this single story of what is happening in Catherine's household. There is also a smaller illustration (placed within a circle on the right hand corner of the recto page of each spread) of what is happening with Elizabeth's Nana in the hospital. In addition to these, there is also an image of St Nicholas and a picture of a church dedicated to this saint on every single spread in the book. It is evident that each of these images and pictures reflects how St Nicholas is perceived in different countries and what the churches look like in these places. There is this one spread that held my attention for a while - the one with the church in India, and St Nicholas on an elephant. I am still trying to understand the illustrator's choice for having St Nicholas ride an elephant in this image. I searched "St Nicholas + India + Elephant," and one of the two interesting and fairly relevant links suggested that there is a short story by Rudyard Kipling called "Toomai of the Elephants" which was published in St Nicholas Magazine in 1893. The other one was about how, in 2009, a person dressed as St Nicholas arrived on an elephant to the German Embassy in the capital of India. There are a few photographs of this St Nicholas on an elephant on Google Images, and I'm wondering if the illustrator drew inspiration for his image from the same. When I saw the illustration in the picturebook, I immediately thought that this was yet another manifestation of the Western stereotype of India being the exotic land with elephants and such. [That said, I'd appreciate if someone can provide me more information as to what St Nicholas in India had to do with elephants. ]3) While the premise of the story is a good one, the narrative itself came across as quite didactic to me. It also seemed to me like there was a lot going on in one spread - four different strands of illustration + a description of the church + a large chunk of text that tells the story. I found myself wishing that there were lesser things to look at on a page. Overall, I appreciate Riggle's choice of topic for this picturebook, but in terms of execution, I wish the theme was handled better, both in terms of words and illustrations. A note about Multicultural Children's Book Day:Multicultural Children’s Book Day 2017 (1/27/18) is in its 5th year and was founded by Valarie Budayr from Jump Into A Book and Mia Wenjen from PragmaticMom. Our mission is to raise awareness of the ongoing need to include kids’ books that celebrate diversity in home and school bookshelves while also working diligently to get more of these types of books into the hands of young readers, parents and educators. MCBD 2018 is honored to have some amazing Sponsors on board. View our 2018 MCBD Medallion Sponsors here: http://multiculturalchildrensbookday....View our 2018 MCBD Author Sponsors here: http://multiculturalchildrensbookday....We’d like to also give a shout-out to MCBD’s impressive CoHost Team who not only hosts the book review link-up on celebration day, but who also works tirelessly to spread the word of this event. View our CoHosts: http://multiculturalchildrensbookday....TWITTER PARTY Sponsored by Scholastic Book Clubs: MCBD’s super-popular (and crazy-fun) annual Twitter Party will be held 1/27/18 at 9:00pm.Join the conversation and win one of 12-5 book bundles and one Grand Prize Book Bundle (12 books) that will be given away at the party! http://multiculturalchildrensbookday....Free Multicultural Books for Teachers: http://bit.ly/1kGZrtaFree Empathy Classroom Kit for Homeschoolers, Organizations, Librarians and Educators: http://multiculturalchildrensbookday....Hashtag: Do be sure to look for/use MCBD's official hashtag #ReadYourWorld. I received this book from #kidlitexchange to read in exchange for an honest review. All opinions are my own. 🌟🌟🌟🌟🌟The Saint Nicholas Day Snow by Charlotte Riggle and Illustrated by R.J. Hughes is a book of a different kind. The story begins with a slumber party and the story of Saint Nicholas Day. An argument of which day he comes and where he leaves gifts, if he will find you when you are not at home, but the grown ups have their own set of worries with a grandparent in the hospital and the weather indicates snow coming soon. The illustrations are very delicately drawn to keep up with each story as well as provide a picture of the churches of Saint Nicholas around the world. At the end there is a cultural story of the truth of Saint Nicholas and how the story varies from culture to culture. Beautiful. Review also posted on Instagram @jasonnstacie, Library Thing, Go Read, Amazon, and my blog at readsbystacie.com. The talented children’s author Charlotte Riggle has done it again. With help from the gifted illustrator, R. J. Hughes, “Charli” has given us a colorful, poignant look at a beloved historic figure through the eyes of two families who celebrate his life in The Saint Nicholas Day Snow (Phoenix Flair Press, October 27, 2017). The story does have an Orthodox Christian setting (and characters) but it will capture readers of all religious and cultural backgrounds. Anyone who loves Christmas and tradition and children and story. When Charli’s first book, Catherine’s Pascha, came out in 2015, I knew she had found her niche. Not that this is the only niche available to her. Charli is a brilliant and gifted technical writer and is knowledgeable in many fields. It takes that kind of genius to write a good children’s book. Genius coupled with an intense love for people—especially children, and even more especially children with special needs and disabilities. I received an advanced copy of the book for review.If you’d like to hear more from Charli about this project, read her blog post, “Why I Wrote the Saint Nicholas Day Snow.” The Saint Nicholas Day Snow will make a terrific Christmas gift for your children, grandchildren, Godchildren, nieces, nephews, and neighbor kids. One of the nice things about a second picture book that involves the same characters as the first book is that you get to learn more about the secondary characters as well as the protaganist. Anyone who has read Charlotte’s first book, Catherine’s Pascha, will remember Elizabeth, Catherine’s friend, who has mobility issues – she uses crutches and a wheelchair. This book has the same premise as Catherine’s Pascha – less an explanation of the feast as one young child’s experience of it. So this time, Catherine and Elizabeth, who is over for a sleep-over with her friend, get to prepare for St. Nicholas’s visit on December 6. The subplots address an issue related to St. Nick, as well as more fully developing Elizabeth’s background and character. While they’re making cookies and preparing for St. Nick’s visit, Peter, Catherine’s brother, and Elizabeth disagree about several important issues around St. Nicholas – when exactly he visits (Peter insists on Christmas Eve, while Elizabeth is equally sure it’s St. Nicholas’s Eve), where he leaves his gifts (stockings hung by the fire or in shoes), how he travels (reindeer or horse) and what he leaves (books or candy). They both agree that carrots must be left for the horse and/or reindeer, but it’s about the only thing they do agree on. When Andrew, Peter’s godfather, shows up to pick Peter up for a sleepover at his house, he relates the story of St. Nicholas and manages to incorporate all the traditions in a realistic and satisfying way – then nips off with Andrew to avoid being caught in the developing snowstorm. Elizabeth, though, hasn’t just come over for a fun afternoon and night – she’s staying with Catherine’s family while her parents travel to be with Nana as she undergoes a serious operation. Elizabeth’s subplot is barely dealt with in the text, except for a couple of mentions, but the illustrations flesh it out in a gentle and touching way. Too often, Orthodox Christian families and parishes seem isolated from the larger world, since our faith, at least here in North America, is so marginal and overlooked in an all too Protestant or secular world. Charlotte’s story is realistic and gives a lovely feeling of connection with our Orthodox lives and the wider world. Her prose is seamless and gently leads the reader through the story without letting the suplot overpower the main thrust of the book. But it’s the illustrations that really stand out. While the main pictures on each page deal with the main plot – Catherine and Elizabeth’s preparations for St. Nicholas day, and their hopes that there will be enough snow to make snowmen, each page also contains a small, set off illustration of Nana’s situation, so the reader can see what is happening as the girls move through their day. Also on each page is a small depiction of churches named in honor of the saint, and various reproductions of images of St. Nick. Yet the page never feels overfull or crowded, and the colours are rich and vivid. Additionally, small touches deepen the connection between St. Nick, the girls and Nana’s situation – when Elizabeth’s mom and dad pray with the priest as Nana is in surgery, the girls are standing in Catherine’s family’s icon corner, also praying for her. As Catherine and Elizabeth sleep in the night, so the priest, and Elizabeth’s parents sleep in Nana’s hospital room, as on the facing page, Catherine’s parents pray for all of them. And as the snowstorm worsens, the snow collects, not only on the window sills and stoops in the pictures, but on the golden circles enclosing the sub-plot and building illustrations. A delight for the eyes, the heart and the mind. I suspect this is a story that children will demand to read, not only once around December 6, but again and again and again throughout the year. A deeply educational story about Saint Nicholas in the Greek Orthodox religion.Anyone who follows my reviews knows that I rarely review overtly religious books, with the exception of books that use religion to teach about culture in a broader sense. I use the phrase, "teach not preach" to describe how I accept or reject religious books for review. This comes about not because of my own religious beliefs, but because of my role as a school librarian. In this story, much as in Riggle's earlier title CATHERINE'S PASCHA, a Greek Orthodox tradition is taught in a child-friendly way featuring a girl (Catherine) and her family. There is a rich historical theme throughout the book with images of different Greek Orthodox churches shown on on each page spread in an inset. In this story, this also a concurrent story being told in an opposite inset revolving around Catherine's friend Elizabeth's grandmother in the hospital.What I appreciate most about this book is the historical information given about a figure that features so prominently in current culture, a figure that has seeped so far into culture as to almost transcend religion. The additional back matter in this book taught me a great deal about how the story of Saint Nicholas and how this morphed into current traditions throughout the world, including a rich history of 1800's America. I would consider this an optional purchase for school libraries, but an appropriate one for religious collections as it does not attempt conversion or preaching. For Christian and Greek Orthodox families and churches, this would be a beautiful story to share in December every year. It is rather wordy, and includes intricate illustrations, so I would see this best used in a smaller group reading setting.Thanks to the author and illustrator for sharing a copy of this title with myself and Kid Lit Exchange for review. The Saint Nicolas Day Snow book for children shares an Orthodox story which may be read to help children understand their own or other religious. I had no idea about the many beautiful churches named for Saint Nicholas. This book has a focus on the children and is for ages 4-8. Does Saint Nicholas visit on December 6 or on Christmas Eve? Will everything turn out well? When Elizabeth has to stay at Catherine’s house she is worried that Saint Nicholas won’t find them. The grownups, though, are worried about snow. Disclosure: I received a free copy of this book. @kidlitexchange #partnerThank you to the #KidLitExchange network fort he review copy of The Saint Nicholas Day Snow. All opinions are my own.The Saint Nicholas Day Snow was a cute little picture book about a girl who is having her best friend stay over right around Saint Nicholas Day. But the two girls' families celebrate the holiday in different ways. Throughout the book the girls learn that everyone's beliefs are different and even if they celebrate on different days with different traditions, it doesn't make them wrong. The girls find a compromise on the night they are together.I also liked that this book had some non-fiction elements included. There's a whole section in the back about what Saint Nicholas Day is and how it got started, etc. The book uses images of real churches and it's a really unique way of pulling everything together. Charlotte Riggle R.J. Hughes - When Charlotte Riggle was growing up, her family moved frequently. She never knew what to say when people asked where she was from. Did they want to know where she was born? Where she had lived most recently? Where she had lived the longest? She hasn't moved as often as an adult, so those questions are now easier to answer. She was born in Oxford, Mississippi. She's currently living in the Pacific Northwest, between Seattle and Mount Rainier. She's lived here longer than she's lived anywhere.Her children are mostly grown now. She and her husband share a charming old house full of books and music, laughter and joy.